Haver & Boecker Zip Guards save wear on vibrating screen cross beams while allowing quick access for inspection or maintenance. ST. CATHARINES, Ont. – Haver & Boecker,a leading equipment manufacturer and solutions provider in aggregates and mining applications, introduces Zip Guard. The 12.5-mm-thick polyurethane liner is installed on the cross beams of a vibrating screen to reduce the impact of passing material. Haver & Boecker engineers designed Zip Guard to support equipment longevity and minimize downtime for maintenance. 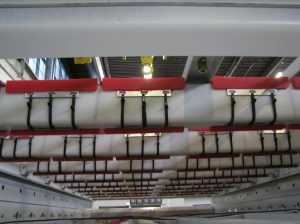 Installed by a certified Haver & Boecker technician, Zip Guard is available for all Tyler vibrating screens and offers easy access to the beam. Zip Guard’s polyurethane barrier not only lasts longer and experiences less wear that glued-on rubber, but inspecting the cross beams for deterioration or cracking is simpler than the glued alternative as the liners are simply installed using industrial strength ties. Cross beams, side plates, feed boxes, discharge lips, bar rails and shaft housings are all structural components that provide rigidity in a vibrating screen. Over time regular wear sacrifices the engineered rigidity required for the longevity of the machine. To combat wear, Haver & Boecker carries a full line of Tyrethane bar rail liners to protect the entire screen deck and maximize the life of both the vibrating screen and the screen media. Customers can upgrade any new or existing Tyler vibrating screen with the protective liners. For non-Tyler vibrating screens, please consult with a Haver & Boecker representative to determine if it is compatible with your machine. To find out more about Zip Guard, email info@havercanada.com or call 800-325-5993.